Joomla! is the world’s hottest open-source content management system, and the winner of the 2006 Open Source CMS Prize. While Joomla! is packed with features, its greatest quality is that it is extremely extensible, allowing any number of complex applications to be cleanly integrated. Shopping carts, forums, social networking profiles, job boards, and real estate listings are all examples of extensions developers have written for Joomla!. All of these can run off one Joomla! site, while only one database, template, and core need to be maintained. When you build an extension to Joomla!, it will inherit the look and feel of the overall site. Any type of program that can be coded in PHP is a potential component waiting to be written! 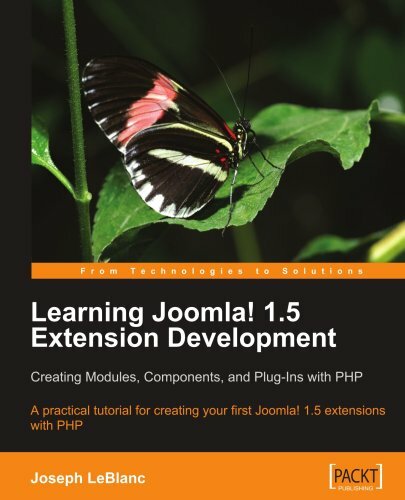 If you’re eager to start creating extensions for Joomla!, this book is for you. Walk through the development of complete Joomla! components and modules with this tutorial for PHP programmers. Written for Joomla! version 1.5 and tested against pre-final releases, this book will get you started coding your first extensions as quickly as possible, and adds the features that will make your work look professional! The book builds example extensions to create, find, promote, and cross-link restaurant reviews. A component will handle common data items seen across all reviews such as price range, reservations, cuisine type, and location. Your visitors will be able to search and sort through the reviews; adding their own criteria to zero in on their dining options for the evening. Your modules will highlight new reviews, drawing the attention of frequent visitors. Finally, plugins will pull pieces of the reviews into feature articles and others will integrate them into searches. Even if you don’t own a restaurant, you will still find the code applicable to your own development projects, and the skills you develop will make you a Joomla! developer to be reckoned with! A practical tutorial, based around the development of coherent example throughout the book. Each chapter walks you through the steps to add a required feature to the extension. This book is suitable for PHP programmers who want to take their first step in customizing and extending the features of Joomla! through custom PHP development. It is not a reference guide for advanced Joomla! developers. You need only the basics of PHP programming; no experience of developing Joomla! extensions is assumed. You are expected to be familiar with the general operation of Joomla!